All it takes is one key on your application interface, and voila – MetaViewer is plugged in and automatically integrated to capture and index everything created by your application suite. It links with any ERP and application from Infor/SSA Global to Microsoft Dynamics to SAP. And it's so easy you don't need to learn a thing to run it. Sound unbelievable? It's not. It's MetaViewer. MetaViewer offers a complete integration suite that can quickly provide existing ERP users a seamless, paperless solution. 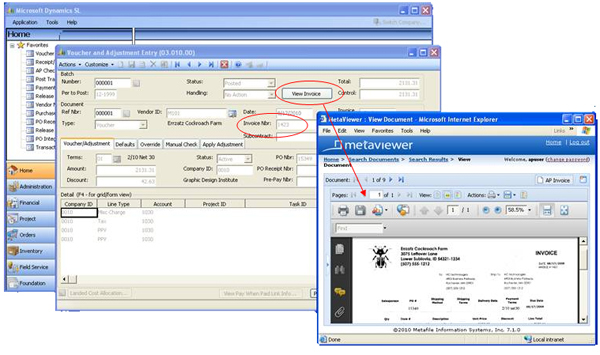 MetaViewer automatically captures and full-text indexes any document or report generated by existing software packages. It can update the ERP application database with invoice line item detail and correct GL coding information, indicate that an invoice is approved for payment or a payment has been received. MetaViewer can use existing information found in the ERP database to easily index newly scanned documents, further reducing data entry. A button can be added to the ERP application which will perform a preset MetaViewer query using the appropriate information found on the host application screen, allowing associated documents to be retrieved and viewed without ever leaving the ERP application. MetaViewer in every sense becomes an integrated extension to your existing application. MetaViewer tightly integrates with Microsoft Dynamics ERP and other financial applications. Paperless Automation + Dynamics AX: The functionality of a powerful, yet simple, integration. An ERP tool set that provides intelligent technology and scalability across the enterprise. MetaViewer and Dynamics GP offer financial and operational functionality for a variety of enterprises. Business management functionality from financials, to supply chain, to manufacturing. Compliance and control are within reach with Dynamics SL and automated workflow. MetaViewer + Your Financial System - Paperless Automation.